PE18-BX ProxEncoder® Rotary Encoder offers quadrature, CAN J1939, PWM and analog outputs with rectangular design. The unit is used for detecting on-axis rotation with up to 12 mm air gap between application and sensor with a 2.5 mm axial misalignment and 30° planar tilt. The encoder is suitable for mobile hydraulic and industrial installations and allows mounting on flat surfaces. Unit withstands destructive environments such as in hydraulic oil, dust control spray, or corrosive wash.
Mukwonago, WI – PE18 ProxEncoder® non-contact rotary encoder product line receives a square housing with side sense capacity. Enhancing the original PE18 proximity style form factor, the new rectangular design allows for easy mounting on flat surfaces. Two USPTO patents enable the PE18-BX ProxEncoder® to detect on-axis rotation with up to 0.5” (12mm) air gap between the application and sensor. The PE18-BX is 100% encapsulated for an IP69k configuration that survives destructive conditions like submersion in hydraulic oil, deep sea salt water, dust control spray, or corrosive wash. The PE18 ProxEncoder product line is designed to cater to both mobile hydraulic and industrial installations. It is available in common communications including analog, quadrature, and CAN J1939. 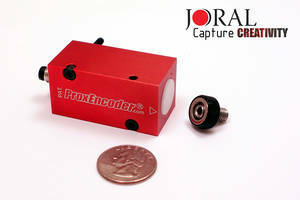 Founded in 2005, Joral LLC is the culmination of a long history of pioneering encoder and sensor technology by companies including Joral Devices, Joral Computer Services, and GS Global Resources. Today, Joral develops and manufactures advanced harsh-duty electronic devices for mobile hydraulics and industrial applications. Joral has redefined the "rugged duty" position sensor by introducing protection methods such as total electronic package encapsulation, LED status indicators, and patented true non-contact coupling.